Finally! The sequel to the popular Waters 1 collection is here and 10 more Photoshop watercolor brush tools are now available in one set for just $5. 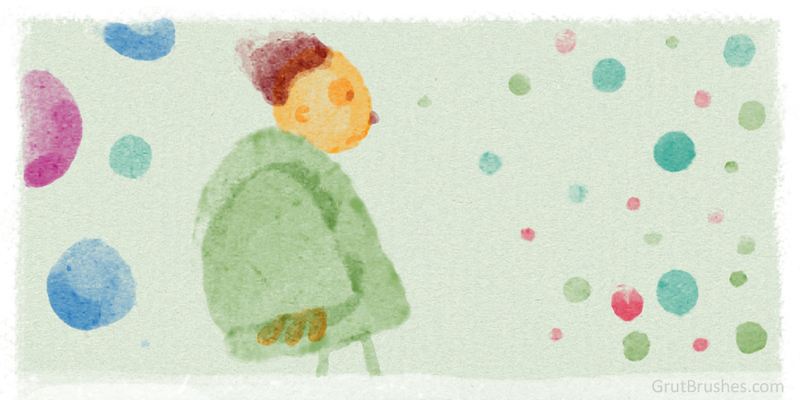 Sorry for the long wait but it takes a while to create a good watercolour brush. Get Waters 02 here or for an additional five you can buy all the sets (about 100 Photoshop brushes now!) for just $10 That deal, (the “All Brushes collection” will be done very soon, probably by the end of August when the price and will be going up, and from then on, the premium single brushes will only be sold separately or as part of a membership There are now about 100 brushes in the set. Get it while it lasts. If you don’t have it yet, you can still get a free watercolor Photoshop brush tool from the Waters 01 set at the link below. This week’s free Photoshop brush is what you would get if you could stuff charcoal into an aerosol can. As always, you can download it for free until the end of this week (August 3rd) when there will be yet another new free brush. “why so many painting brushes? What about something for sketching?” Well, I’ve heard you Jann and others who’ve kindly sent me some lovely feedback. 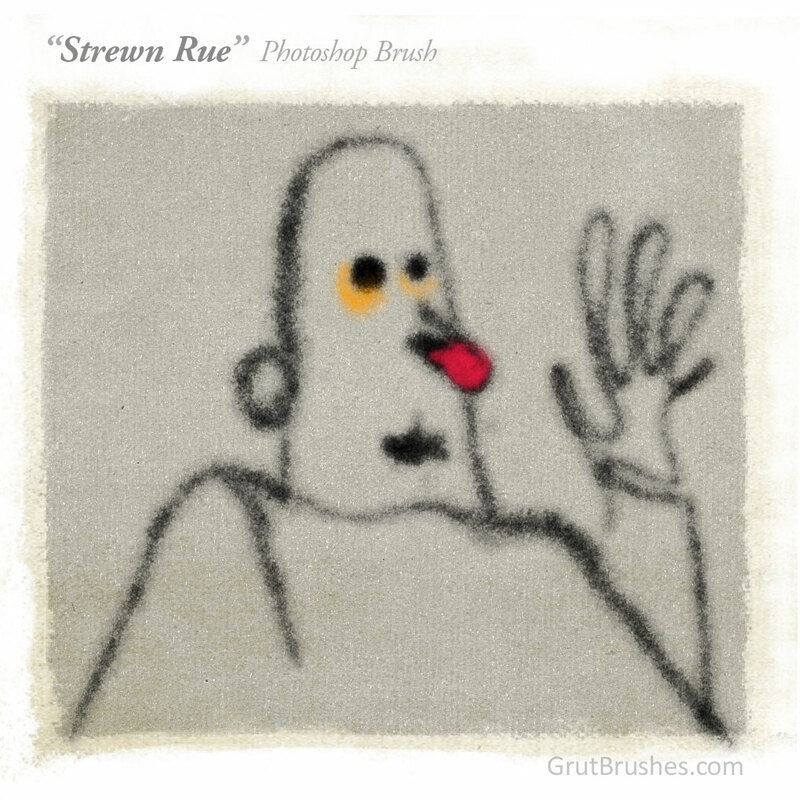 This week’s brush is for you who like nothing better than to draw sketch and doodle. Dusky Covet is a thin ink brush with a light start for sketching but deposits a lot of oily ink with some firmer pressure. The ink is viscous and wont ‘dry’ until you lift your stylus so you can shape it and mush it around a bit if you care to. As always, you can download it from the shop or the member’s free Photoshop brush page for free until the end of this week (July 27th) when there will be a new free brush. 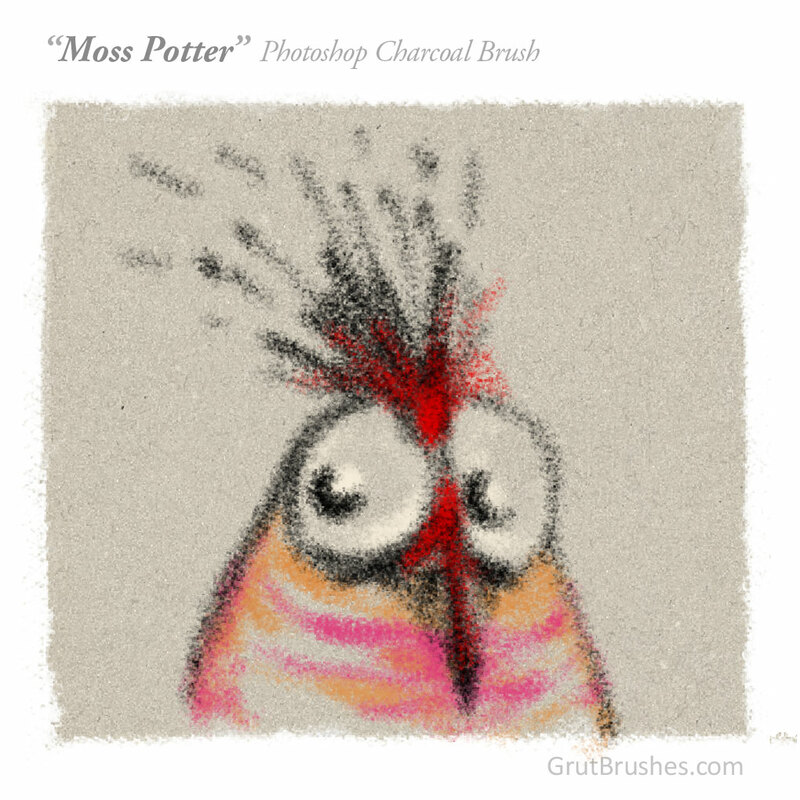 Following close on the heels of this week’s debut of the ‘Moss Potter’ charcoal brush, I’ve added a new charcoal brush to the brush shop. Ramp Braiser is a stark textured natural media brush with distinct spore pattern. Soft repeated strokes will render fuzzy shading while harder broad strokes leave a large-grained rough charcoal texture. 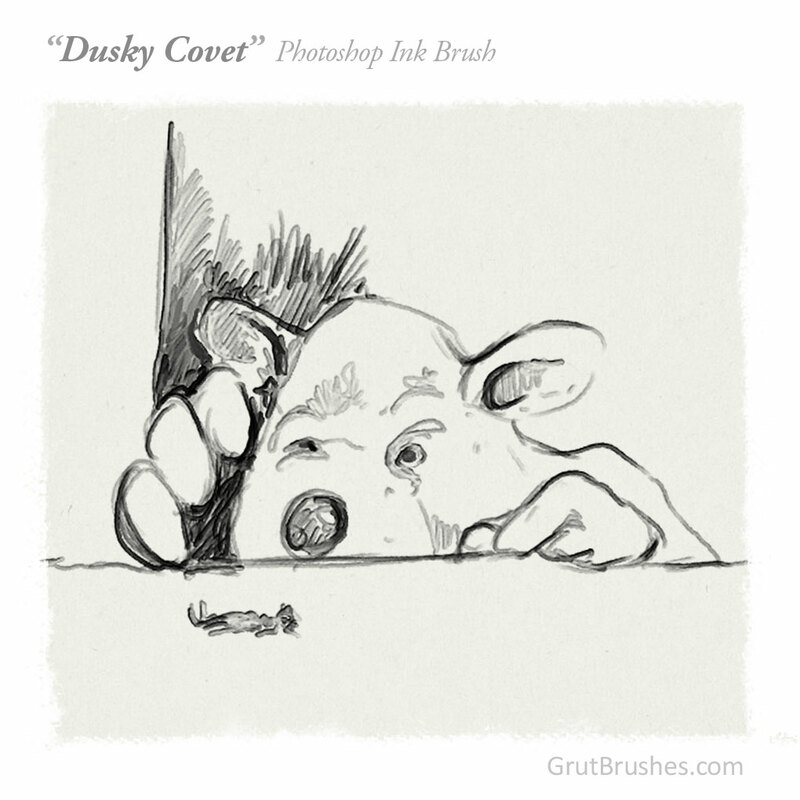 This week’s free GrutBrush is a versatile charcoal brush with a wide tonal range. With a medium firm stroke this brush will give you a mid tone of about fifty percent coverage, press harder or double back on your stroke and you can fairly quickly get to an opaque full cover. Brush lightly to use it as a tonal sketching charcoal. As always, you can download it from the shop or the member’s free Photoshop brush page for free until the end of this week (July 20th) when there will be a new free brush. *requires Photoshop CS 5.5 or higher and a pressure sensitive drawing tablet. free registration required to download. 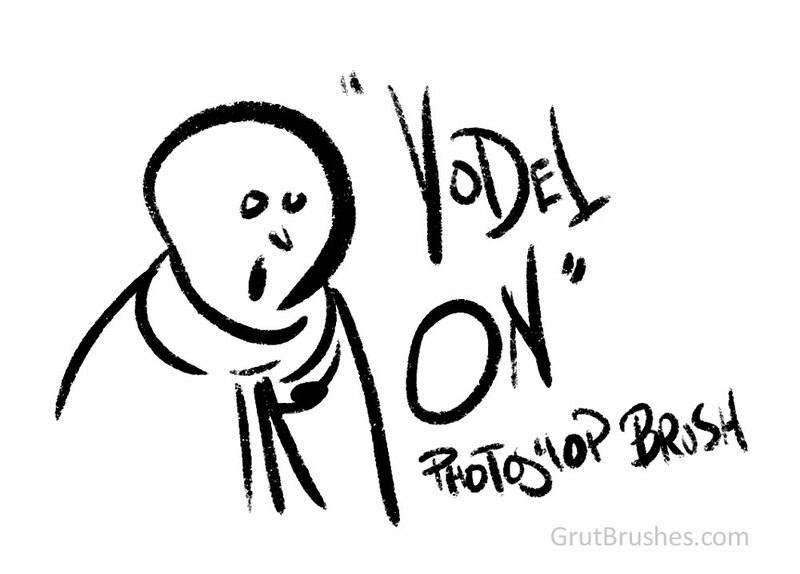 This week’s free GrutBrush is Yodel On, an opaque gouache brush with a very wide range in width and generous tapering. This brush has a relatively steady line with middling pressure but shows increasingly dispersed bristle texture at the lower and higher pressures until it bursts free into expressive grainy splotchiness at full stylus pressure. As always, you can download it from the shop or the free Photoshop brush page for free until the end of this week (July 13th) when there will be a new free brush. *Requires Photoshop cs5 or higher and a pressure sensitive graphics tablet. Free registration required to download. 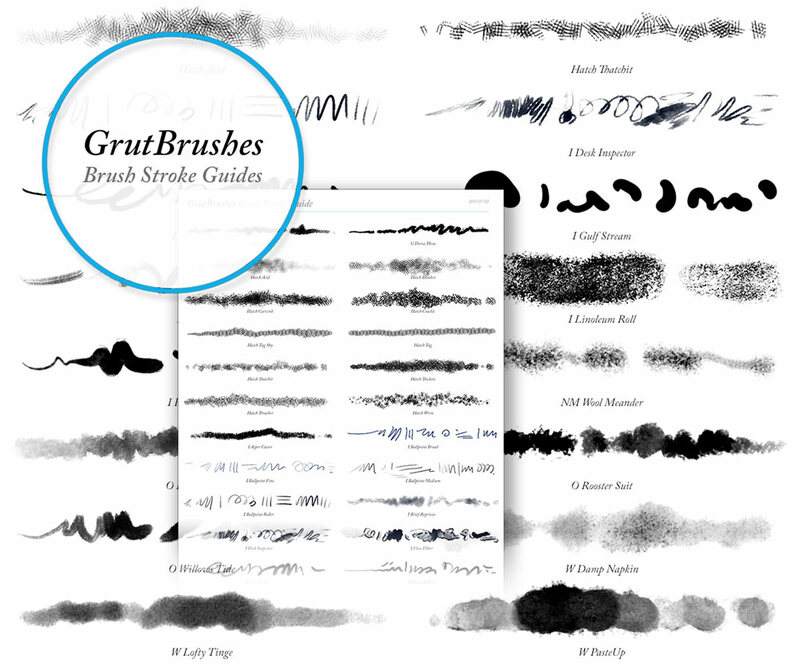 GrutBrushes Brush Stroke Guide Cheat Sheet Now available! The GrutBrushes Photoshop brush stroke guide is here! 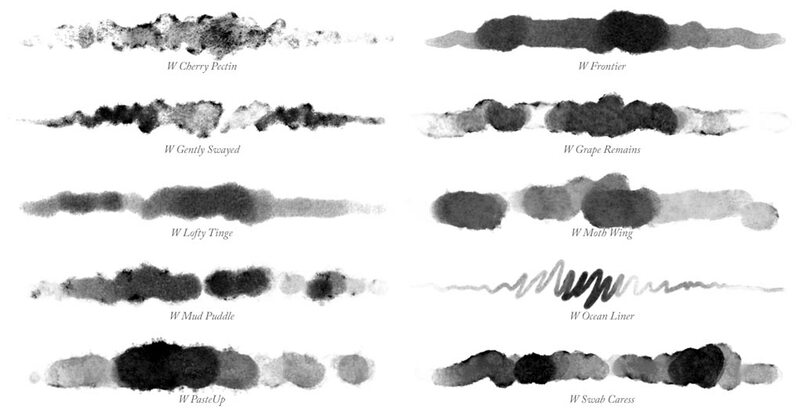 You can now see hand drawn brush strokes representative of every single Photoshop brush by downloading the brush stroke reference guide from the new ‘resources‘ section on GrutBrushes.com It’s available to download as either a JPG or PDF (It’s a tall image, so be sure to zoom in!) Or view the online version where you can hover over a brush stroke and see it up close with a magnifier window. There are more guides on the way, including a detailed brush stroke sampler for each brush that shows a standard variety of brush stroke drills. Inspired by the excellent real media brush reviews by Teoh Yi Chie of Parka Blogs who turns reviewing art supplies into an art form of it’s own. Of course, the best way to preview the brushes is still to click the play icon on each brush in the shop and watch it drawing ‘live’ in front of your eyes. But I hope the one page catalogs will be a useful visual references when you are looking through your list of GrutBrushes or just need some inspiration.